50th St. betw. Broadway and 8th Ave.
For those who couldn't make it to Washington, D.C., for the 78th Annual Scripps National Spelling Bee on June 3, 2005, cable television had them covered. The finals, won by 13-year-old Anurag Kashyap over Aliya Deri (also 13), were shown on ESPN. Network executives contend that broadcasting the nation's largest language contest reflects the sports channel's duty to show any fair and vigorous competition. Everybody knows that if you can spell, you're not athletic, though: you're academic. Your idea of a good workout is probably tracing Middle English nonce words to sources in early Sanskrit. Take your seat in the stands at The 25th Annual Putnam County Spelling Bee and you'll see emblems of sporting achievement juxtaposed with standards of scholastic excellence. Pennants celebrating the Piranhas's recent basketball victories place the upcoming spelling tournament in a local gym; a basketball hoop facing the microphone puts the spellers implicitly on the foul line; and the first contestant to take the stage confides, "my parents tell me, just to be here is winning/ but I know it isn't so." Having earned a place at Broadway's Circle in the Square by way of the Second Stage Theater (the theatrical equivalent of the regional finals) -- and having now won two Tony Awards -- The 25th Annual Putnam County Spelling Bee conspicuously spotlights American attitudes towards both language and competition. Playfully scored, the musical atones for the ways spelling has, historically, set Americans apart. The production works as an immersion program. From the moment you enter the theater lobby, you are sent back to junior high. Bulletin boards display student work and posters promoting model behavior (e.g. "Silent and Listen are Spelled with the Same Letters") color the room. Enter the theater itself, and anyone who has attended secondary school in this country will recognize the scene. 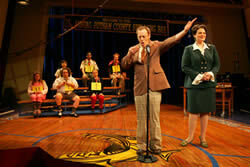 The director (James Lapine) and set designer (Beowulf Boritt) could have easily presented the Bee on a stage, platform to many a school assembly, but they set this particular spelling contest in the Putnam middle school gym. The decision makes sport of the players' studied lack of athleticism. Thus Leaf Coneybear, home-schooled and questionably socialized, nonetheless speaks for the group when, on entering the arena, he admits to having "never been in a gymnasium." Other conceits from the world of sports broadcast the bee's exhibition of mental, rather than physical, conditioning. The contest's announcer supplies color commentary, for instance, massaging her remarks with contestant trivia and explanations of sophisticated spelling techniques. Nike and Pepsi evidently passed, but the Putnam Optometrists sponsored the event (and why not, for what do we do at the optometrists' office but try to ascertain the right letters?). Only in contestant William Barfee (that's bar-fay) does physical grace combine ably with an aptitude for spelling, as William's approach involves tracing letters on the boards with his nimble "magic foot." With characterizations such as these, the Bee attempts to endear its audiences to its idiosyncratic competitors, and most reviewers have responded in kind. Something more thoughtful and less sentimental is also going on, however, in the musical's opposition of spelling to sport. Significantly, the first word spelled, by the announcer reliving her own past glory, is "syzygy": from the Greek "syzygos" or "yoked together," meaning "a nearly straight-line configuration of three celestial bodies (as the sun, moon, and earth during a solar or lunar eclipse)." In setting this bee in a gym and to song, The 25th Annual Putnam County Spelling Bee aligns three portentous entities -- Standard American English (SAE), Yankee individualism, and the American musical theater. The two rituals that launch the bee establish the production's target. First, just as the singing of the Star-Spangled Banner typically precedes our professional athletic contests, the Pledge of Allegiance commences every school day. In this competition, which depends on (and promotes) the Received Pronunciation, the Pledge is pronounced notably out of synch. It's not that the players don't know the words or, like kindergartners, mangle its phrases unknowingly. It's that they are half-hearted, lackadaisically delivered, voiced at variance with one another. The subsequent reading of the rules of the bee is, by contrast, keenly and communally attended. The implication here is that the rules of the bee accomplish far more in transmitting traditional American values than the daily recitation of the Pledge of Allegiance. That a bee should be represented as characteristically American is owed, first of all, to the variability that characterizes English spelling. Spelling furnishes grounds for suspenseful competition only when orthography, or "right writing," can be engendered by many plausible combinations of letters: in other words, when i comes before e, except after c and occasionally other times, or when the sound [ay] can be written as in "weigh" or "pay" or "fey." In a transparently and universally phonetic language such as Spanish, everyone could easily transcribe sound to letter, and thus everyone would be a winner. There would be no point to a competition. When the Bee's significant lisper, Logainne Schwartzandgrubenierre, is tendered only words possessing English's many sibilants, spelling becomes an absorbing and amusing spectator sport. A word like "cystitis" -- an embarrassing condition that moreover puts awful pressure on poor Logainne -- speaks volumes about the humbling potential of English spelling. Protesters against our punishing spelling system stage demonstrations every year at the national bee. As with the first such reformers in 16th-century England, contemporary advocates for spelling reform campaign for a strict, phonetically based orthography, an alphabet in which each letter designates only one speech sound, or phoneme. Somewhat ironically, we owe to the first English spelling reformers the very first dictionaries in English: writing in protest of orthographic reform, renowned Elizabethan pedagogue Richard Mulcaster recommended that spellings be "stayed," or stabilized, through publication in "hard word" lists. Mulcaster included such a list in his 1582 Elementarie, and Richard Cawdrey's A Table Alphabeticall, the first English dictionary, followed in 1604, setting English words in -- a phrase so familiar, it's hard to believe it was ever strange -- alphabetical order. Thus the variability of English spelling got preserved in print, as the notion of a "standard English" developed in tandem with the publication of reference texts. In the musical, the stability theoretically offered by dictionaries is addressed, even challenged, through the poignant figure of Olive Ostrovsky. Sadly, Olive's parents are no-shows to the bee: her mother seeks enlightenment on an Indian ashram, and her father is AWOL (along with Olive's $25.00 entrance fee). Introducing herself, Olive sings about her "friend the dictionary," which fills in as the significant authority figure in her life. It also "stays" where her parents do not. In fact, the production's most tender and affecting song -- occasioned by "chimerical," from the Greek "chimaira," meaning "existing only as the product of unchecked imagination: fantastically visionary or improbable" -- tacitly links the absence of Olive's parents to the illusory authority of English's most trusted reference book. Just as her mother's quest for self-knowledge is indefinite, and the location of her father is unknown (he never turns up), language habits are moving targets, and durability in language is an epistemological chimera. (As proof of this fact, the Scripps National Bee contains on its Web site the following Editorial Note: "this web page contains the full text of an early 1930s document chronicling the history of the National Spelling Bee. Some spellings and usage that appear herein are not standard today.") We kid ourselves if we think either dictionaries or bees truly stabilize actual usage. Rather, what endures is the ideal of Standard American English, a standard long associated with other social, indeed national, values. Not coincidentally, these values date to the late sixteenth and early seventeenth centuries, when the first English settlers reached shore in the wake of Cawdrey's inaugural dictionary. Exhorting disciples to adhere to impossibly high standards of both linguistic and spiritual conformity, the Puritans approached language with the same zealous righteousness with which they approached their religion: in Puritan logotheology, speaking correct English dovetailed with moral rectitude. As an added benefit, the intrinsic variability of English spelling -- increasingly preserved and authorized in English dictionaries -- demanded for its mastery labor redolent of the Puritan work ethic. The story we tell children about the pilgrims' flight to religious freedom really ought to include the settlers' pious, even persecutory, assumptions concerning "right writing." Instead, we hold spelling bees. The Bee acknowledges that, despite English's origins in England, the spelling bee is unique to the United States and its colonial outposts. First, the production's title -- besides designating a certain quaint parochialism, and honoring the show's origins in a Massachusetts workshop -- evokes the first spelling contests staged in settlements of the colonial U.S. In addition, the Bee's voluble announcer, and its most ardent spokesperson (she's a previous winner), represents the colonial impetus that brought the first bees into being. Having fully internalized the contest's rules and ideology -- trilling, "that's what's swell about spelling bees, when winners lose" -- the announcer proctors the contest, ensuring adherence not only to correct spelling but also to the rules of the competition. Just as important, she is later reported (in the post-bee "where-are-they-now" review) to be pursuing her goal to "bring competitive spelling to the less fortunate" in Third World and developing nations, all while remaining Putnam County's "top realtor." As the Putnam Bee's ideologue, the judge embodies the correlation of spelling bees with the occupation and distribution of territory. The 2002 documentary Spellbound considered the oddity that children of the politically and economically dispossessed view a triumph in spelling as proof of the American dream. The film--the Hoop Dreams of spelling--tracked eight finalists' painstaking preparation for the 1999 national bee. One of them, Angela, came from a family living and working on a Texas ranch, having crossed the river from Mexico. Her parents had yet to learn English. Angela studied by pasting the new words she learned in crossword patterns on construction paper, and her brother divulged that, although her father was unlikely to journey from the ranch where he labors, "it would be closing [sic--closure] for him to go to Washington and see her" in the final. Another contestant, from a tony Connecticut prep school, deliberated whether her au pair should accompany her to Washington that year. Victory in spelling may be putatively attainable by all, but inequities were plain to see. 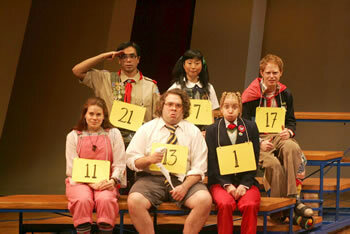 Missing, however, from the nearly exclusive focus on individual contestants in both the The 25th Annual Putnam County Spelling Bee and Spellbound is how spelling bees reward, in bittersweet fashion, good old-fashioned American individualism. Indeed, where other native varieties of bees (e.g. sewing, quilting) ask neighbors to pitch in with the production of essential, mutually valued goods (i.e. clothes, bedcovers), spelling bees yield only one trophy-holder, at the other participants' publicized expense. (There is no consensus among etymologists on the origin of the word "bee" as a gathering of people to perform a specified act or skill. The insect parallel is hard to miss, however, since bees work together to complete a task for benefit of one individual, the queen.) Max Weber once observed that the kind of work ethic required to master English spelling also fosters the individual, head-to-head competition that stimulates capitalism. Perhaps it's appropriate that the individuals who triumph in the regional bees are rewarded with a trip to Washington, D.C.; for in spelling bees, Every Child Gets Left Behind, save one. Take poor Chip Tolantino in the Putnam County bee. Last year's winner, he is outdone early on by his erection, as his arousal destroys his concentration. ("My stiffy has ruined my spelling," he sings). A stock bit of schoolroom comedy, it works here to denote the bee's restriction to a particular phase of pre-adolescence: the time in every boy's life when he has to learn about the birds and the bees is more or less the time when he outgrows the spelling bee. Knowing how to spell "omphaloscepsis" or "tittup" (the word that torments Chip) matters less than whether he has internalized the contest's rules, or learned what education theorists call the "hidden curriculum." The patches on his Eagle Scout uniform display the concepts of the covert syllabus: perseverance, patriotism, and deference to authority. But as the musical also reveals, even steadfast effort and obedience to rules will not always get you what you want. For one thing, the rules of English spelling are inconsistent, even mystifying (why is the [ooh] sound in "zacoochie" spelled with "oo," but "sluice" uses "ui"? ); and the guidance offered by authorities is frequently unhelpful ("Can you use it in a sentence?" "Yes, please spell 'telephone'"). For another thing, life is unfair. One contestant is given "phylactery" and another "hospital"--prompting the musical's one true Broadway showstopper, "Life is Pandemonium." ESPN execs will say that this disparity makes for riveting television. English teachers will say that, where elementary pedagogy cycles between "whole language learning" (teaching language in context) and "language decoding" (teaching spelling through phonics), the endurance of spelling tests in our nation's schools reflects the need to quantify abilities that are largely unmeasurable. In this era when schools must compete for federal funding on the basis of national standards and measured results, The 25th Annual Putnam County Spelling Bee atones for the sin of using language to rank and divide ourselves. Reviews of this show have typically looked upon it as "the little musical that could." Accounts of the production's success have assumed that spelling makes unlikely material for a Broadway hit. In fact, the inherently collaborative aspects of American musical theater effectively counteract the competitive individualism of the bee, giving the performance a particular counterpoint and harmony. Of course, every musical demands a love plot, and the Bee complies with William and Olive. These two contestants court one another, awkwardly, over word games involving the exchange of vow(el)s. Olive: "If you switch the first two vowels of my 'Olive,' you get 'I love.'" William: "If you switch the first two vowels of 'William,' you get . . .uh . . . 'William.'" The last two contestants in the competition, they dance with each other, and thus make cooperative use of William's deft "magic foot." But when Olive falters on "elanguescence" (from the Latin "elanguescere," meaning "the gradual loss by the soul of its powers"), William is forced to choose: the way of connection and cooperation or the way of competition and individual victory. That William second-guesses himself for the first time at this moment points up the paradox of the production: the means the theater medium uses to bring us together is used in bees to set us apart. Besides bringing William and Olive together, the musical also offsets the divisions demanded by bees by bringing several audience members onstage as contestants. A recent New York Times article cited this practice as evidence of the current vogue for audience participation (also seen in Spamalot and Dame Edna: Back with a Vengeance!). The practice sometimes leads to surprises. In the performance I attended, the last audience participant onstage spelled correctly the word she was expected, in effect scripted, to miss. It was a nonce word, in fact, and while not Middle English, a word more aptly culled from early American: a Nantucket whaling term which, at the musical's behest, I shall not repeat. That a nonce word -- a word known to have appeared in print only once -- should have failed to guarantee the contestant's ejection demonstrates the possibility of people connecting even to words that don't circulate widely in society. But perhaps more profoundly, the production had to improvise around the audience member's unexpected spelling success. Her momentary coup led to the kind of free play and improvised action that characterize the theater and also counter the idea, and ideal, of invariable, unerring standards. Another way the show could have challenged the values implied by spelling bees would have been to cast a speller who didn't fit the stereotype, such as an athlete who was also good at spelling. Besides William and his "magic foot" (truly the only lithe thing about him), the only contestant said to possess any genuine athletic ability is Marcy Park -- who, in addition to running track, speaks six languages, performs ballet, and, to the audience's delight, takes over playing at one point from the orchestra's pianist. Marcy represents the prototypical well-rounded student, and, as a Korean-American, is a caricature of the Asian overachiever. (Despite the dominance of Middle Eastern competitors in recent runnings of the national bee, the musical doesn't feature a contestant of either Indian or Pakistani descent.) When Marcy follows up her impressive exhibition of her skills by defiantly throwing the competition -- declaring her aim "not to live up to expectations" -- the purpose of casting stereotypes for contestants becomes clear. The audience is meant to observe this typecasting as another form of standardization, and to appreciate the characters' refusal to conform. In this way, the Bee does much more than answer our need to see our inner nerds rewarded. By inviting the audience to cheer for the characters' collective non-conformity (in lieu of rooting them on to individual victory), the production challenges the ideal of standardization. Finally, it also encourages us to appreciate the shared experience of language through song. Thus the finale, which returns all the players to the stage, not only recognizes the combined efforts of the Bee's ensemble but also acknowledges the audience's participation, as the performers hail the spectators on each flank of the three-sided seating area. Interestingly enough, bright, 13-year-old Aliya Deri, runner-up to Anurag Kashyap in the 2005 national spelling bee, lost the competition on "roscian," from the Latin name Quintus Roscius Gallus, a famous Roman actor, and meaning "characteristic of Roscius as an actor; famous or eminent in respect of acting." 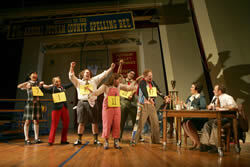 Apparently, the conjunction of spelling and things theatrical remains a stretch for many, including those critics who have treated The 25th Annual Putnam County Spelling Bee as a novelty piece, an aberration in an otherwise serious season. In fact, this musical is as sober an inquiry into native piety as the Pulitzer-winning play Doubt, and it deserves unqualified accolades even beyond its two Tony Awards.